Our MRO Powertrain Division (Dangle Aviation) has been an FAA Repair Station and Overhaul Facility since 1995. We are an industry leader in the repair of the UH-60/S-70 Black Hawk, S-58T, SH-3 and S-61 helicopters. This division is sought out in critical safety items, airframe repair and overhaul, component overhaul, and also has limited power-plant service capabilities. Our MRO Powertrain Division is recognized as a leader in critical safety systems. With the strict guidelines, rules and regulations governing the work done in this field, we are your experts in repair and maintenance in many areas. This division has earned its stellar reputation for airframe maintenance and repair procedures, limited power-plant repairs and is well known for its capabilities in component overhaul. 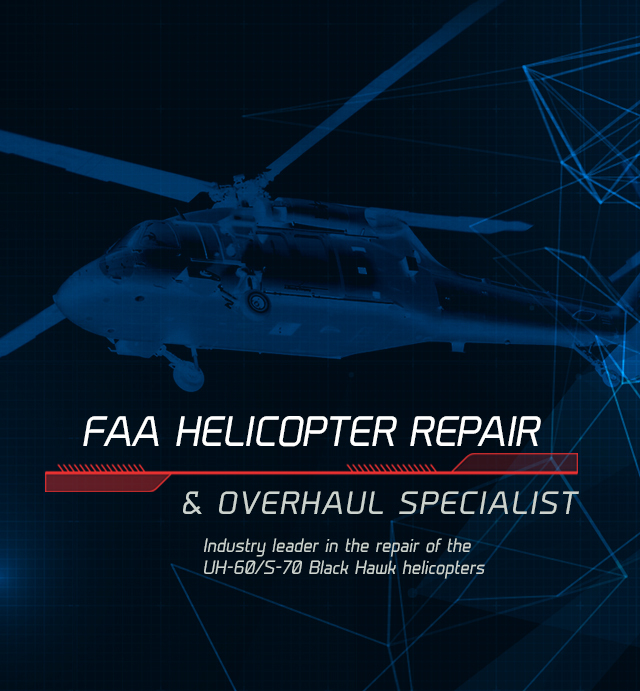 Our immaculate safety record and strong reputation have propelled us to be designated the UH-60/S-70 Black Hawk FAA Repair Station for TAIGLOBAL Group. We can turn your dampers around in one week or less with our complete in-house services: Liner Bonding, Pressure Testing, NDT and Full Load Testing. Our MRO Powertrain Division operates under the supervision of Jon Dangle, our Shop Manager. Jon has over three decades of experience in this field. This division has a stellar record working in the highly regulated FAA MRO industry. His strong reputation makes our MRO Powertrain Division your best choice. The incredible safety record maintained in this division makes us the right choice of FAA Repair Stations for several operators and U.S. Government agencies. At our FAA Certified Repair Center, our MRO Powertrain Division is capable of a complete overhaul of UH-60/S-70 Black Hawk and other helicopters. If it can be repaired, we will repair it. Our team has an extensive component knowledge, carries a full line of technical publications and are certified under FAA regulations. This means all components overhauled meet the highest standards and will keep your aircraft safe and flying efficiently. When components are beyond repair, we team up with a leader in aircraft parts to get what you need, when you need them. Your complete satisfaction is our goal and with the TAIGLOBAL Group team backing us up, we always come through. Our MRO Powertrain Division proudly provides Full Load Dynamic Testing for the main rotor damper assembly in our facility. We perform all bonding and machining of all liners and all non-destructive testing. All damper piston rods are pressure, flow and leak tested before installation into your damper. Our damper tester uses calibrated electronic transducers to measure displacement distance and torque. This allows for greatly reduced test cycles. All testing results are available for individualized reports configured to display all measured performance parameters for each test article. State-of-the-art technologies, combined with our industry-leading team, provides you with proper diagnostics and repair options for your fleet. If you have any questions about our capabilities or have any repair questions about your aircraft, we are standing by to assist you. Please call us at 520-294-7294. With its limited airframe certificate, our MRO Powertrain Division is certified by the Federal Aviation Administration to perform class specific maintenance as listed here. Our commitment to exceeding the standards set to work on U.S. Government and commercial aircraft is evident by our excellent track record.Our MRO Powertrain Division has operated for many years with no FAA violations or fines. Our MRO Powertrain Division is committed to keeping our customers in the air. Our priority in upholding that goal is the repair and maintenance of your helicopters’ critical safety systems. Our team of experienced technicians are here to keep your systems in working order. We pride ourselves on our customer service. We are here to answer any questions you may have and take the time to give you the answers you need to make informed decisions about the best course of action for whatever challenges you have. If we don’t have the answers, we will find them. If you have any questions about the capabilities of our repair facility, please call and speak to one of our team members at 520-294-7294. Our MRO Powertrain Division provides complete structural repair for the UH-60/S-70 Black Hawk helicopters. We are able to repair everything from minor to major structurally damaged aircraft in our facility and have the staff, the tools, and the experience to make sure the job is done right the first time. Our MRO Powertrain Division is an FAA Certified Repair and Overhaul Center that specializes in the UH-60/S-70 Black Hawk, S-61/SH-3 Sea King and S-58T. We have a long history of excellence in the aviation community for working with various civilian and government organizations. Our MRO Powertrain Division team is made up of highly skilled professionals. This dedicated group of skilled technicians ensures that all work is done to the highest standard while keeping costs down for our customers. Our team has the experience to think on their feet and adapt to your specific repair situations. The MRO Powertrain Division first opened its doors in 1994 and became a FAA Certified Repair Station in 1995. It’s founder, Jake Dangle, spent 27 years of his professional career as a Tech Rep for Sikorsky. Jake traveled the globe helping customers solve problems before opening his own repair station. While focusing on the UH-60/S-70 Black Hawk, we also have experience working on the S-58T, the SH-3, and S-61 platforms as well. The MRO Powertrain Division has gained a solid reputation for component overhaul services, critical safety system repairs, airframe maintenance as well as limited power-plant repairs and maintenance. Our MRO Powertrain Division is led by Jon Dangle, our Shop Manager. Jon has over three decades experience working on various helicopters. In addition, he has been an FAA Repair Station Manager since 1986. Jon has maintained a strong reputation and makes the repair station your best choice. The incredible safety record maintained at in our MRO Powertrain Division makes us the right choice of FAA Repair Stations for several first response teams and U.S. Government agencies.